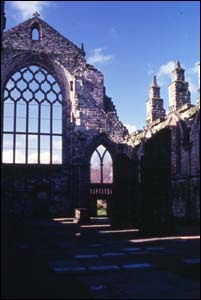 The original Abbey is said by tradition to have been founded by King David I in 1128. When hunting in this district, a stag is said to have charged him causing him to fall from his horse. With arms outstretched in defence, it is said he opened his eyes to find the beast gone and in his hand a fragment of the True Cross. The new monastery, a tribute of gratitude, was served by Augustinian Canons from Merton Abbey near London; the small church based at Merton would provide the model for what would be built at Holyrood. This in turn was replaced by a far more imposing building, commissioned in 1190. A rival to many a cathedral for scale and grandeur, it was for over 450 years site to a variety of major royal events. Following the Reformation, the abbey was suppressed and its monastic buildings deserted. All but the nave was spared when the church came to be destroyed, since this served as the parish church of the Canongate Burgh. The last significant historical event to take place here was the Scottish coronation of Charles I in 1633. In 1768 the roof of the building collapsed bringing down much of the structure with it. Access to the Abbey is available via entrance to Palace of Holyrood House.